2.2mm High Bright EZ-MOUNT EL Wire is GREAT for those applications where you need to sew the el wire into a bag, hats, safety vests, costumes, back packs, clothing, cushions, or maybe you need to nail or staple el wire onto a hard surface.� Use with any inverter or sequencer for amazing lighting effects. Our High Bright EZ-MOUNT el wire is water-resistant (NOT WATERPROOF). INDOOR use ONLY! EL Wire emits a spectacular uniform light source 360 degrees throughout its entire length. 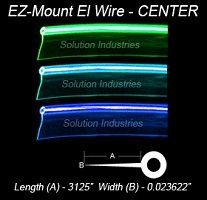 EL Wire is Non-Toxic, cold to the touch, very durable, and resistant to water and ice. EL Wire (electroluminescent wire) is a cool running, flexible, lightweight, low power light source. The wire itself has a copper core coated with phosphor and plastic. Around that plastic coated core are two ultra thin wires, and the whole assembly is encased in clear or colored plastic to give it color. EL Wire runs on an AC current at 400-4000hz, so you must attach it to an inverter or sequencer to make it light up. Inverters and sequencers run on 1.5-12 volts DC, so you can get one small enough to fit in the smallest space, or one large enough to light your entire car or business sign. There are a large variety of options available in EL Wire, inverters, and sequencers, so you can use EL Wire nearly anywhere.